Today we have a guest post from Allison Cooling from Quiet Lion Creations! 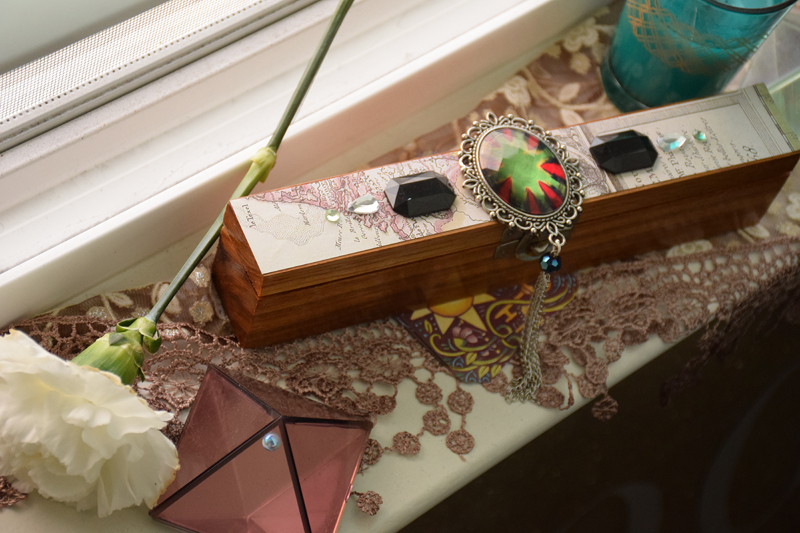 She’ll be showing us how to create these gorgeous DIY jewelry boxes. Read on for the full tutorial! Major sparkle and shine make up these pretty recycled boxes! This embellished home decor DIY is super customizable, so you can pick and choose colors, paper styles and more to make a piece all your own! 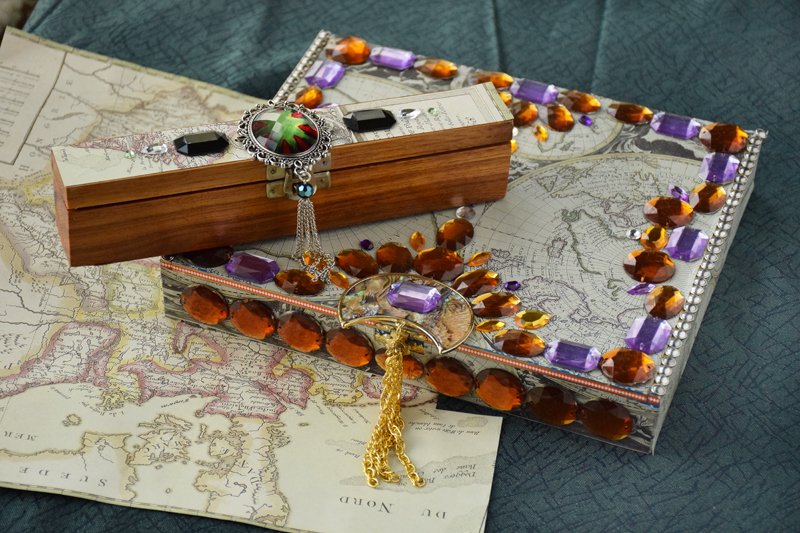 Using flatback gems, cabochons and even chain tassels adds a totally bohemian vibe – these boxes are recycled (one of them an old cigar box!) so they are perfect for placing around the house. 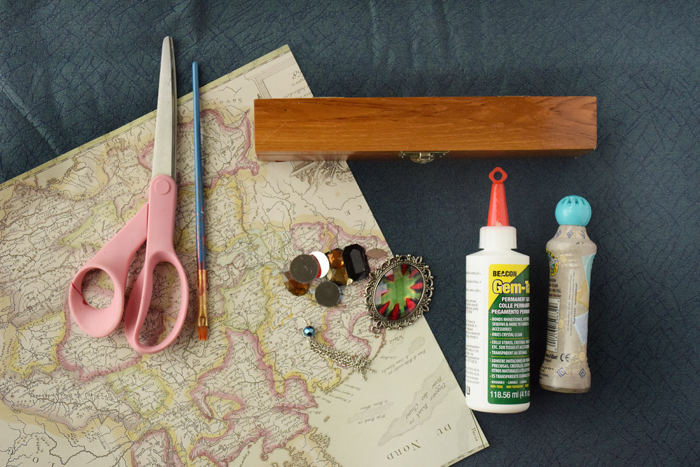 Use them to hold things like beads, coins, jewelry and more! Step 1: Gather materials. 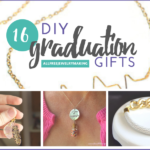 You will need a wooden box (or a cigar box), scrapbooking paper, scrapbooking glue, Gem-Tac, scissors, a paintbrush, acrylic flatback gems, a large flatback filigree cabochon or medallion, and other ornamental decorations (such as a chain tassel — these are up to you!). Step 2: Cut a piece of decoupage paper the exact size as the top of your box. 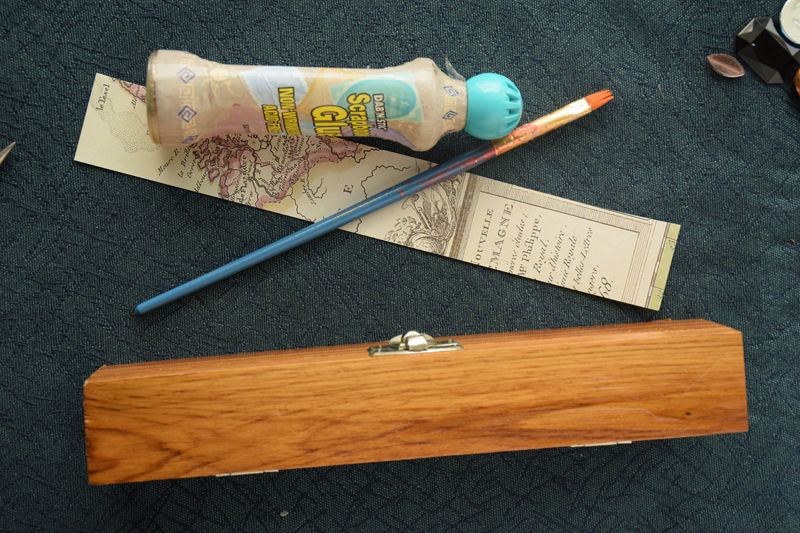 Coat the top of the box with a thin layer of scrapbooking glue. 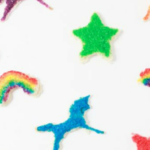 Press down your paper (starting at one side and flattening to the other) to prevent bubbles. Rub to get out any bubbles that may occur. 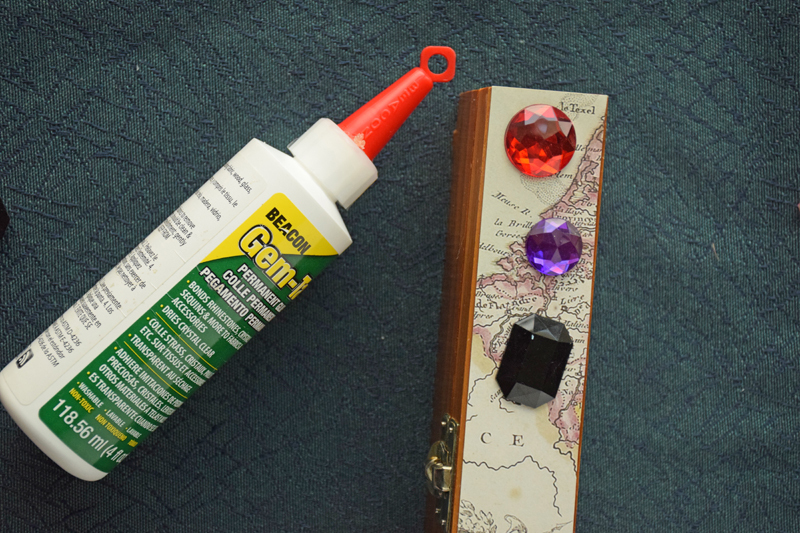 Glue on gems to the top of your box with the Gem-tac. There is no right or wrong way — bling it out!! I played around with placement of these gems, and ultimately ended up just using the black gems and smaller clear teardrops. 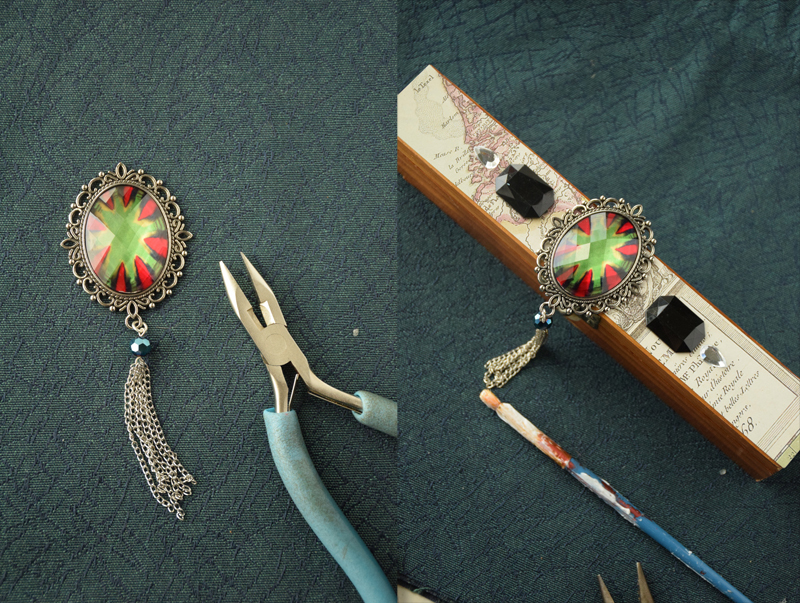 Step 3: If you are using a chain tassel and cabochon (you can find these pre-made at craft stores), connect it to the bottom of your filigree cabochon. 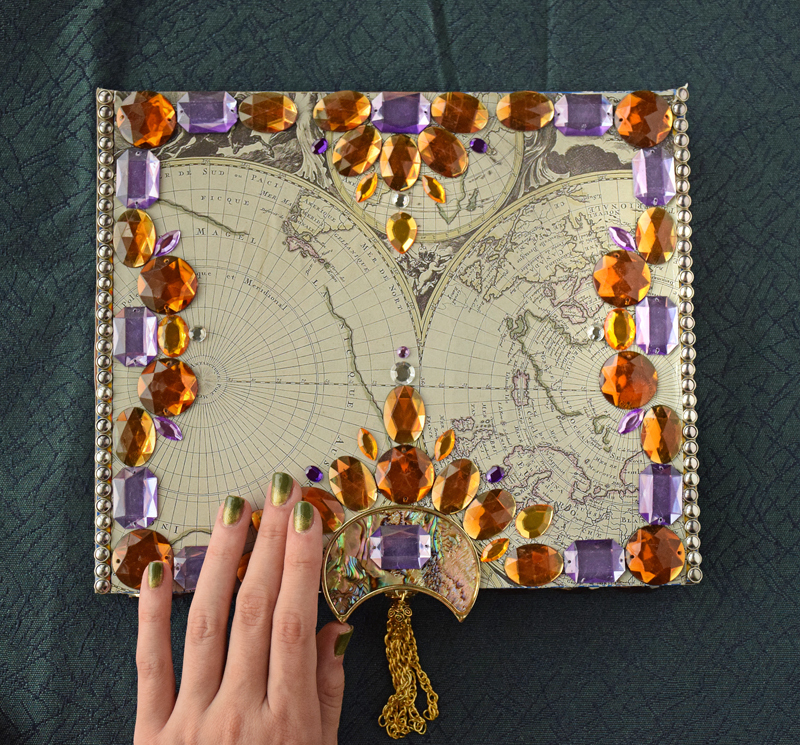 Use a pea-sized dollop of Gem-tac to glue this to the very center of the box, so the tassel hangs down. Let the box dry overnight. You can certainly cover the entire box with scrapbook paper, if you’d like! I’ve shown you the simpler style DIY, but get creative and make as minimal or as glamorous as you please! 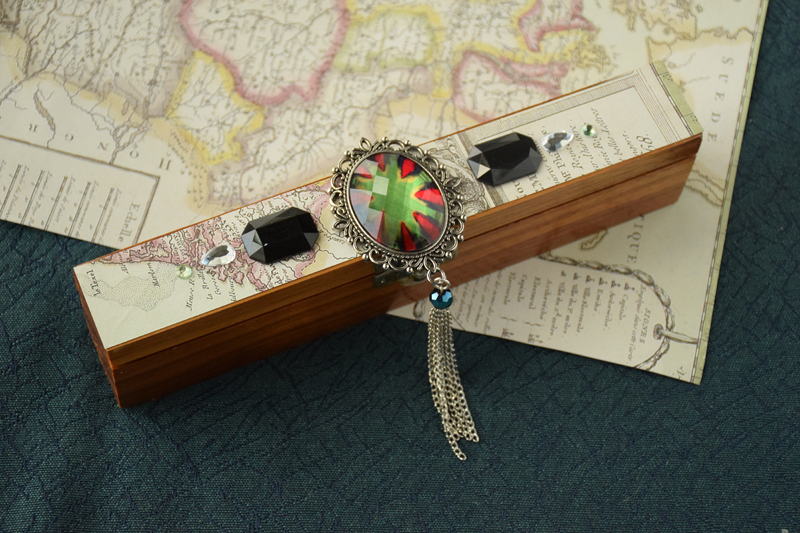 This version was made from an old cigar box – I totally decked it out in a bunch of flat backs! 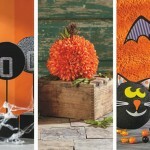 This is the perfect statement piece to add to an end table – it will surely catch eyes! 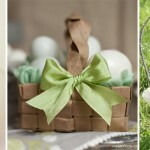 You can view all of my other tutorials at quietlioncreations.com!! Thanks for reading! Oh, wow! This is a great project. 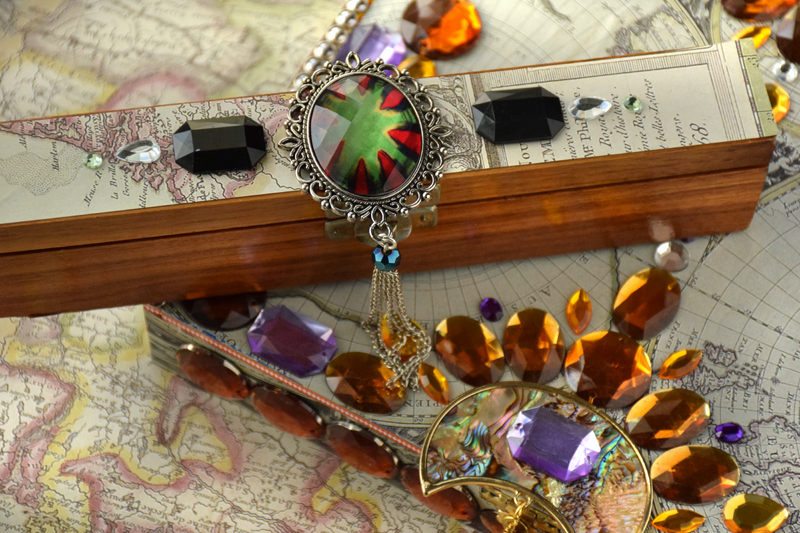 I love the contrast of the subtle tones in the paper and the sparkle of the gems. I could tell right away that it was from Quiet Lion. I’m such a huge fan of just about everything she does. Have you seen her jewelry? Oh my goodness! This is just incredible! And I love the fact that this IS easy enough for kids to do! I am going to suggest we do this for my daughter’s Brownie Troop next school year. 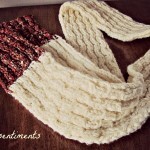 The girls will love it and it will be a great gift for them to give (maybe at Christmas)! 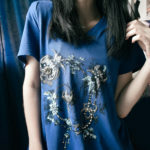 I also want to say that your photographs are just perfect! 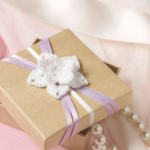 They showcase exactly how to create these boxes and they are so clean and crisp! They really make me want to make these boxes! Thank you! Lovely craft. A new one for me to try. Thank you.